Apple Season is here! Gravenstein apples are starting us off. Everyone keeps asking if the Gravensteins are ready. It is finally time! (Gravenstein are the only apple ready now! Ruby Mac and Gala will be coming next but NOT ripe yet). Gravenstein apples are an old time favorite. They are excellent for baking and applesauce, probably one of the best, in many people's opinion. Sweet-tart flavor with an excellent crunch. Many people I know, will let the apples sit for awhile before they use them for their pies, almost until they are getting a few days from throwing out, but not too soft that you can't use one of those apple/peeler/corer "machines." They make a really good pie filling that breaks down some, instead of staying in stiff slices. We have half a row of Gravenstein so if they are a must for you, don't waste time in coming. They usually go pretty fast. 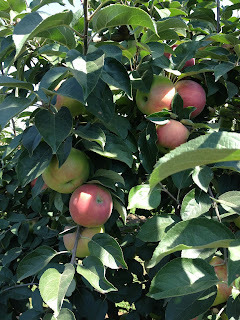 The closest way to find the Gravenstein apples, and the least far to carry the buckets are if you park up by the office/shop instead of out back like you would later in the season. Follow the signs that are to the south of the shop and they will take you out to the Gravensteins. It will be a bit self-serve for Gravenstein, but once we get going with Ruby Mac and Gala, we will have people working to help you more out in the orchard. In the meantime, I hope the signs will guide you to where you want to go!